NASA's 70-meter Goldstone antenna located near Barstow, Calif. The antenna can be used as a radar tool to study near-Earth asteroids during close flybys. When the asteroid 2012 DA14 zooms by Earth today (Feb. 15), some astronomers won't be waiting for it to give up its information. Instead, they will be aggressively pinging it with groundbased radar. Most forms of astronomy are passive: Scientists must wait for signals coming in from objects in space, the researchers exercising no control over the information they receive. Not so with radar, which scientists use to bounce signals from Earth off of objects in space. For today's asteroid 2012 DA14 flyby, scientists will track the space rock over several days in hopes of learning how it spins and what its surface is like. The asteroid will fly within 17,200 miles (27,000 kilometers) of Earth during today's close shave. Meanwhile, astronomers are working it identify what type of meteor exploded over Russia early today. According to Russian authorities and local media reports, a meteor exploded over a thinly populated section of easter Russia in the Ural mountains early this morning, shattering windows and injuring more than 500 people. It was not related to the asteroid 2012 DA14 flyby, NASA officials said. As an asteroid such as the 150-foot wide (45 meters) 2012 DA14 passes near Earth, scientists can aim powerful radio waves at the object. When waves hit the asteroid, they bounce off, returning to Earth. The ways in which the transmitted signal has changed can provide information about the velocity, distance, shape and rotation of the object. "With much larger asteroids — and most of the objects we study are larger than 2012 DA14 — we can see features on the surface," Benner said. Radar observations of asteroids are take asteroid n from two sites on Earth. The Arecibo Observatory in Puerto Rico is the most sensitive, but its 1,000-foot (305 meters) dish is set firmly in the ground, limiting it to a view of only 30 percent of the sky. Goldstone Observatory, located in the Mojave Desert in Southern California, is the more mobile of the two telescopes. The fully steerable instrument can cover about 80 percent of the night sky. "The two telescopes compliment each other very well," Benner said. Distance is the biggest limiting factor for radar. The telescopes regularly observe objects hundreds of feet in size at distances of 6 million to 12 million miles (10 million to 20 million kilometers), about a tenth the distance from Earth to the sun. "In principle, we could detect a golf ball at the distance of the moon using radar," Benner said. Scientists haven't sought out any asteroids at that size and distance, but they've regularly observed rocks a couple of meters long at two-thirds the lunar distance. When Goldstone fires its radar into space, the telescope produces 450,000 watts; Arecibo transmits at about twice that power. Only a small fraction returns to the cooled dish. By the time the signal returns to Earth, the dish is ready to capture it. Then the dish returns to transmission mode and fires off another signal. The result is a series of time exposures. This weekend, as 2012 DA14 passes closer to Earth than the communication satellites in geosynchronous orbit, the radar signal will bounce back faster than the dish can change modes. While Goldstone won't be in position to view the asteroid at its closest approach, the signal will still return to Earth in just over a single second. At the start of observations on Friday night, it will take 1.2 seconds for the radar to leave Earth, bounce off the passing asteroid, and return; by the time the first round of observations conclude on Saturday morning, it will take 2.1 seconds for each signal to return. If Goldstone were able to track the asteroid at its closest approach, the signal would only take two-tenths of a second to return to the dish. When an asteroid travels that close, researchers use a second dish as the receiver. 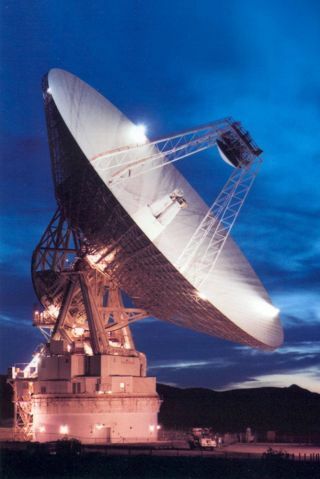 At Goldstone, the receiver is 12 miles (20 kilometers) away, the role served by another dish in NASA's Deep Space Network, an international collection of antennas spanning the globe. Information collected by radar can be extraordinarily precise. Asteroids are often measured with a precision of a few tens of meters, even at great distances, a precision that exceeds measurements collected by optical telescopes. As a result, their orbital paths can be calculated with greater precision. "For 2012 DA14, we expect that when we get radar measurements this weekend, we'll be able to compute its motion decades farther into the future than we would otherwise," Benner said. Such precision can help scientists calculate the likelihood of potential future collisions. Radar measurements also help to identify possible mission targets for spacecraft. The upcoming OSIRIS-REx mission scheduled for a 2016 launch is designed to return to Earth with a sample from an asteroid; astronomers have used radar to scan potential targets. The telescope at Arecibo twice studied Itokawa, the asteroid visited in 2005 by the Japanese sample-return mission Hayabusa. "In addition to all of the scientific objectives, we do a number of things to support missions," Benner said. In 1968, an asteroid just over three-quarters of a mile long passed within 4 million miles (6.4 million km) of Earth. Astronomers used an older telescope at Goldstone Observatory, as well as one at Haystack Observatory in Massachusetts, to make the first radar observations of an asteroid. In the 1980s, radar observations of asteroids at Arecibo and Goldstone increased, but according to Benner, they've become even more frequent in the past few years. Part of the reason for the upswing in observations has to do with improved technology; astronomers are better able to pick out asteroids in the sky. But interest has also peaked in recent years, Benner says, with the announcement of NASA's aim to send an astronaut to an asteroid, and two private companies announcing their intent to mine the nearby rocky bodies. And the prospect of space tourism brings an added possibility; people may find themselves traveling to asteroids in the near future to get away from it all, Benner said. But even with this increased interest, radar-based astronomy presents a number of challenges. Because asteroids are comparatively small, optical telescopes often can't pick them up until they are relatively close. To conduct radar observations, scientists must have a good sense of where in the sky the object is. That means collecting a wealth of optical data about asteroids over time, to allow for more accurate predictions of their path. "A lot of those observations come in from very dedicated and well-equipped amateur astronomers," Benner said. "Amateur in the sense that they are not getting paid for it, but they're doing professional-quality work. Their help has been invaluable." With 2012 DA14, by contrast, scientists have had nearly a year to prepare. Because radar involves actively firing signals into space, scientists have to coordinate with a number of government agencies. Goldstone Observatory has to deal with over 20 agencies in the area, ranging from nearby military bases like Edwards Air Force Base and Fort Irwin to the Federal Aviation Administration. The radio signals are no threat to passing aircraft, but the work still requires coordination. Although the public eye is on 2012 DA14, it is not the only asteroid currently being observed. Brenner notes that Goldstone is in the middle of observing three other asteroids at this time. "2012 DA14 is an extraordinary one because it is going to get so close, but it is by no means the only one we're [studying]," Benner said.